On Wednesday, the GRP in Uttar Pradesh booked Iqbal and Izhaar. But back home in Jhakra Village of West Champaran district in Bihar, the duo claimed they were not on the train. First, a six-year-old girl, Munni, was found dead along the railway tracks in Sitapur, in Uttar Pradesh, on Tuesday. Near her were her injured sisters Anbul, 7, and Saleeba, 4. A day later, their mother, Afreen, 40, was found dead around 50 km away near the tracks in Maigalganj area of Lakhimpur Kheri district. Her 11-year-old daughter, Rabiya, was found unconscious with severe injuries near the tracks in Mahmudabad area. The woman and her daughters were reported to have been pushed off the Amritsar-Saharsa Jan Seva Express. According to the Government Railway Police (GRP), Anbul said they had boarded the train from Ludhiana with their father Iddu, Afreen’s cousin Iqbal and his friend Izhaar. Anbul reportedly told them that Iqbal and Izhaar had pushed them out of the moving train, and she saw their father “crying”. On Wednesday, the GRP in Uttar Pradesh booked Iqbal and Izhaar. 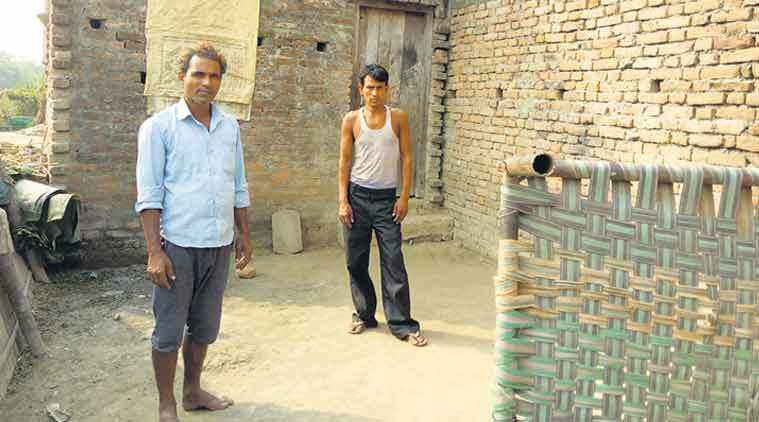 But back home in Jhakra Village of West Champaran district in Bihar, the duo claimed they were not on the train. “Ask any of the villagers. They will tell you we were here all along. There is some conspiracy here. Anyway, we are not running away. We will wait for the police to come,” said Iqbal, who drives a tractor. “It looks like the girls are naming us to save Iddu,” he said. “I do not know why the girls named us. We were on good terms with Iddu too,” said Izhaar, a farmer. Ashok Verma, Circle Officer, GRP, Lucknow, said they had booked the duo based on Anbul’s statement, “though she has been changing her statements frequently”. “Initially she told reporters that her father pushed her out of the train, but later she changed her version and alleged that her maternal uncle, Iqbal, and his friend, Izhaar, threw them out of the train,” said Verma. On why Iddu had not been named in the FIR, Verma said, “The girl is now sticking to her statement that her maternal uncle and his friend threw them out.” He added that a GRP team was in Bihar and he was “yet to get complete details”. While police said Anbul told them that her brother, Layeem Ansari, 8, was also on the train with them, villagers in Jhakra said Iddu and Afreen had five daughters, no sons. Iddu and his fifth child remain untraceable. Villagers said Iddu, 45, worked as a mason in Jammu and Kashmir, and occasionally visited his family in Jhakra. They expressed surprise that the family was reported to be on a Saharsa-bound train on October 23. “How can that be possible? On October 23, they took a train from here to J&K. Iddu had come to the village the previous day and on October 23, he took Afreen and their children with him. This was the first time he was taking his family to his workplace and they were very excited,” said Saira Khatoon, a relative of Afreen’s. Iddu, a resident of Paharpur, 5 km from Jhakra, had married Afreen about 17 years ago. Six years ago, Iddu sold his small plot of land in his village and moved in with his wife’s family in Jhakra. “The family shared a two-room house with Afreen’s mother and brother. The girls went to the government school in the village. Iddu was mostly in J&K, and there would be months when he sent no money to his family. Afreen would then borrow and beg from neighbours to feed her daughters,” said Ameena Khatoon, a neighbour, adding that though Afreen’s mother had a ration card, Iddu’s family didn’t have one since they had no address proof in the village. Afreen’s mother Rabiya Khatoon and brother Ishekhar Ansari, 14, were visiting Rabiya’s family in a neighbouring village. As villagers sat around in groups discussing the incident, Mohammed Salim, an elderly villager, said, “We don’t understand. Why would anyone throw Iddu’s daughters off the train? And even if somebody did, what was he doing?” These are questions that remain unanswered. “We are not sure what exactly happened. There might be a possibility that Iddu could also be a victim and some other person is involved. But what makes him a suspect is that if such an incident had happened, why didn’t he contact the police,” said Saumitra Yadav, SP, GRP, Lucknow. He said they were trying to trace Iddu and his fifth child, and their photographs had been sent to all the GRP stations. Yadav said they had been informed that both Iqbal and Izhaar were in the village, and the duo would be taken into custody. According to Yadav, Rabiya told the police that Iddu, Afreen and their daughters had boarded the Darbhanga-Amritsar Jan Nayak Express at Jagdishpur railway station on Monday. He said they had also received information that Iqbal and Izhaar had not accompanied the family, but these details would have to be verified.